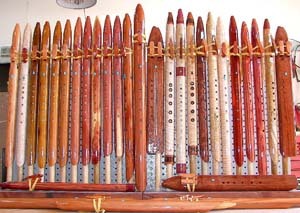 In this section, you will find Native American style flutes that I have made in the past. Some are one of a kind and will never be repeated. However, some can be special ordered. If you see one you like, e-mail me at crowflutes@aol.com or call 888-778-3688 and we can discuss your desires to have one constructed. In the meantime, I hope you enjoy the tour! Links to unique flutes at the original web site.